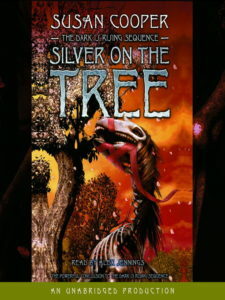 Silver on the Tree is the final book in The Dark is Rising Sequence. Here, all the important characters from the Light and the Dark come together for the final battle. I’m not sure if it was because both times I listened to this, it was too late to give it my best attention, or if it was the story itself, but this was my least favourite of the series. Alex Jennings returns as narrator, along with the other characters adding a sense of unity to the series. However, I got confused by a lot of time jumping with Merriman and Will and with the Drew children. It gave things a disjointed feel and made references to a lot of things in history that I wasn’t very familiar with. In a printed book or ebook, I could have stopped and looked things up. But that is much more difficult with an audiobook. I had looked up some of the myths and legends in the previous books, but that was just harder here with the historical periods as well. We first get to know Will’s family a little bit. There was an all-too-relevant little side-story about racism being a part of the Dark and the Stanton family show their good character. Then the setting returns to Wales for the most part, similar to The Grey King and including the characters from that 4th book too. The Drew children join Will and Bran there. Again, Jane is used to connect to the feminine power of The Lady of the Light, but otherwise is mainly being motherly to the others. Read the rest of my review at Loopy Ker’s Life. Share the post "The end of the Sequence"